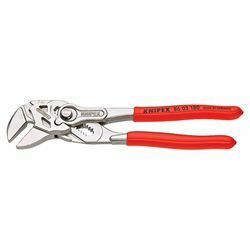 Combining gripping pliers and an adjustable wrench, these tools can easily tighten and release screws, nuts and fittings up 1 3/8" (35mm). The parallel smooth jaws are completely adjustable and are quickly adjusted at the push of a button. Non-slip handle covers and stable leverage allow you to apply ten times your hand's power against the bolt or nut you're trying to loosen.